On one of many trips to the Southern Highlands, I returned to Belmore Falls, one of the most impressive waterfalls in NSW. 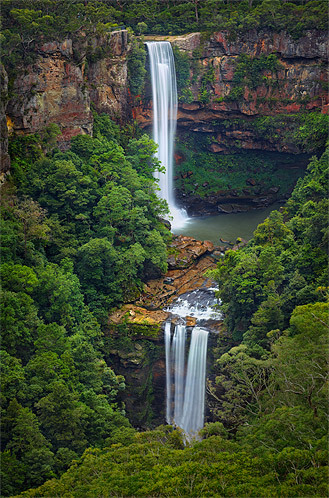 Its vertical two-tier drop is impressively enclosed by steep surrounding cliffs, which makes for a difficult capture with 200m cliffs offering high views of the falls. I found this angle and was able to strike a balance between the flow of water, the rainforest and the three-dimensionality of the composition. Captured on a 60 megapixel digital medium format camera.